Multiple grids as above. Grids approximately 15x25. Add/remove grids as needed. 1v1+1 to pugg goals. Players play 1v1+1 games for 90 seconds each then rotate teams/roles. Nuetral players can not score. Players get 1 point for a regular goal, and 3 points if they are able to use the pressure from the front move to beat defender (correct timing). - Tight pressure or loose pressure? Grid as above approximatly 30x25. Two lines of yellow players in corners, one line of gray (Defenders) players in opposite corner as shown. Balls with line of attackers directly across grid from defenders. On hand signal from attacker, play is live. Other attacker must make a overlap run on start. Attackers try to score for a goal, defenders try to win the ball back and score for their team. Four minutes to attack for each side. Team with the most goals wins. * Quick overlap and stay onside! 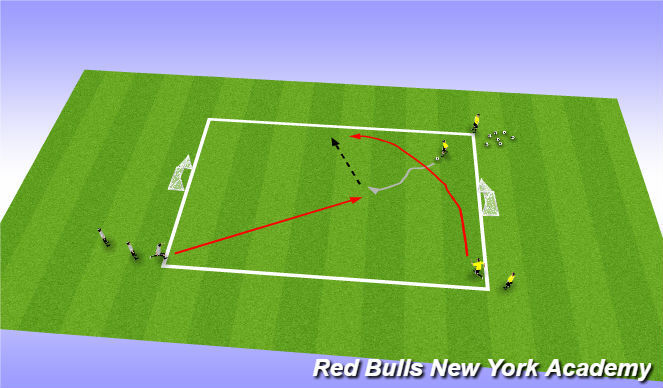 1) If attackers are having success, switch balls to defending line. Defender must push the ball out to attacker then game is live.